To clean your radiator, use some warm soapy water with a soft sponge and a whole lot of elbow grease! All Models available in different Heights, Lengths and Depths. All Radiators for Water or Steam application. All Radiators built to size and capacity of heat. 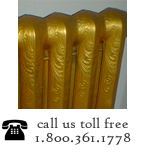 All radiators can be sandblasted and painted your color of choice. Please submit color code of Benjamin Moore High Quality Paint. Please use our Radiator Request Form to submit dimensions of room, windows, doors and exterior walls so we can calculate heat loss.